Americans put in more hours at work last year. They also managed to find more time to sleep and watch television. – Work and work-related activities for all Americans averaged three hours, 35 minutes a day last year, an increase of seven minutes from 2013. 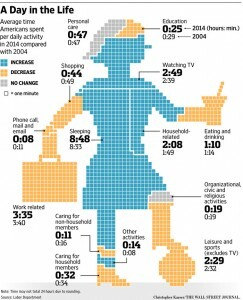 – Leisure and sports took up five hours, 18 minutes of the average day last year, up two minutes from the prior year. That total included two hours, 49 minutes of TV time. – Sleep remained the single largest daily activity in 2014, accounting for eight hours, 48 minutes of the average day. That is up from eight hours, 44 minutes in 2013. Time devoted to education dipped last year. An average of 25 minutes was spent in the classroom and on homework in 2014, down from 29 minutes in 2013. Most other changes in the survey were minor. Americans spent one minute less participating in sports, exercise and recreation in 2014 compared with the prior year as well as one minute less on housework and one minute less shopping. That stands in contrast to the idea that people are living busier and more frantic lives. Work hours fell during the recession and have rebounded with the broader economy. Not only did Americans work more last year, but more Americans in the survey were employed.